Stroke the mat. Stroke it. Now stop. Don’t touch! 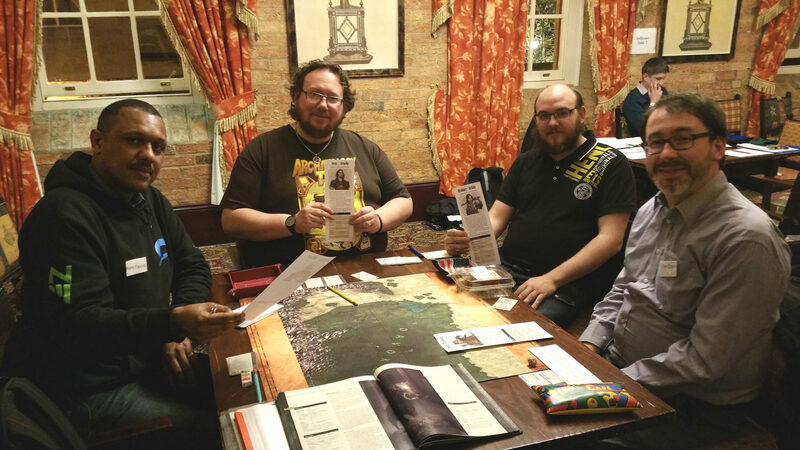 The Symbaroum playmat certainly drew some attention at Seven Hill this weekend, from people playing the game and others just walking by. Some people asked about it, other people needed to touch it. Compared to a poster map, the play mat takes the experience a little bit further. The cushion softness beneath falling dice; the slight resistance that keeps reference cards in place. On a couple of occasions, people walked by the table only to pause, take a step back and ask a question – normally, “Is that a map? What’s it made of?“, followed by a touchy-feely moment. 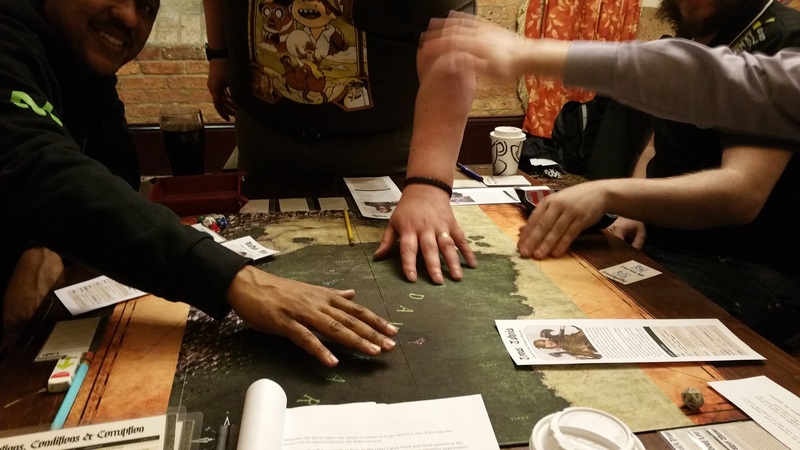 I believe that a map can focus the attention of the players at the table rather than distract, especially when you can cleanly and clearly associate the location of the characters with something on the map. If you can just stand up or lean forward and point – that seems perfect to me. It does take up a bit of space, but most tables used at conventions have been big enough to manage. I did hear people comment that the Davokar map just seems to present a lot of green scattered with a few distant places – but I want to get that sense of scale out there to drive home the threat. Ambria lurks at the bottom like a cowering animal before the roaring abomination of the great forest. Good. That needs to be stated, clearly. I got my custom playmat from friendly local store Patriot Games in Sheffield, UK. They offer a service to print (and if you need help, design) custom playmats – aimed primarily at the tabletop card gamer, I imagine. However, given the tendency of tabletop roleplaying games to use things like cards, dice, counters and so forth, the playmat service seems a perfect fit. I contacted them and after some consideration decided to go large. 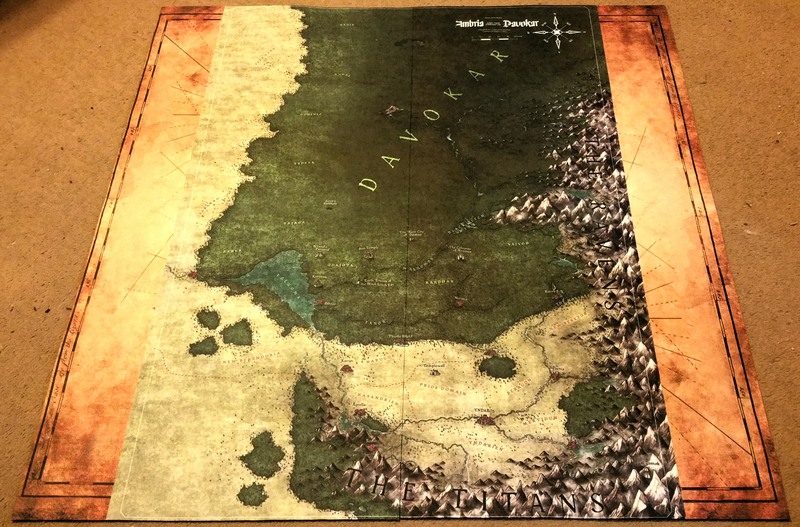 The Davokar map runs to A2 dimensions, but playmats are long and thin affairs. I could either opt for one playmat with space at the top and bottom or – as I did – go for two mats with the map split down the middle. As you can see, that means you need to fill in some space on either side. If I had the wherewithal to think about it I could have got some game rules or guidance built into the parchment filler; I think it looks great as is. The parchment edges mean the player can lay down their Ability and Power Reference Cards on the side of the mat without obscuring the map. The playmat has a rubberised base and should stand up to some serious use through the coming year or two of heavy convention play. I expect I’ll see how it deals with stains and rough handling, but it feels robust and the site has solid reviews on the mats. When not in use, you can roll it down into a solid ‘baton’ with a rubberised heft. Handy if your players start causing a fuss.